Since the beginning of the shale era, the North American natural gas industry has been keenly focused on the outlook for key pipeline takeaway projects in the Northeast. Recently, several major pipeline projects—most notably, Rover Phase 1 and Leach/Rayne Xpress—have been placed into service and have allowed Northeast gas production to reach record highs. Even more pipeline takeaway capacity remains in development in the Northeast. In fact, from now through the end of 2018, another eight pipeline expansion projects—totaling 11 BCFD of capacity—are scheduled to come online in the region. These projects will facilitate even greater production growth and by providing significant new takeaway capacity, will likely boost prices in the core producing zones. In September 2017, ETP received FERC approval to place its Rover Phase 1A into service. The project, which runs west through Ohio, promptly ramped up to 700-1,100 MMCFD of flows through the end of 2017. Flows increased again this January when Phase 1B of the project went into service. 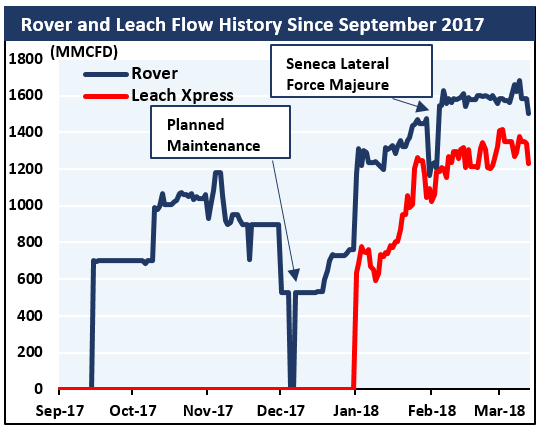 The addition of Phase 1B as well as the commencement of new supply contracts has kept flows on Rover near 1,600 MMCFD through the first few months of 2018—approaching the project’s total capacity of 1,700 MMCFD. Similarly, the 1,500 MMCFD Leach project—which runs from the Utica west through southern Ohio—was brought online on January 1, 2018. As of mid-March, project developer TCO reports it is flowing near 1,300 MMCFD. The rapid increase in flows along these projects, however, is not entirely the result of incremental gas production, as some shippers (e.g., TCO) have elected to simply divert gas flows from TETCO to the Leach Xpress project instead. Still, EVA estimates that the completion of both projects has resulted in the addition ~2 BCFD of incremental production in the Northeast. With Rover and Leach in service and running near full capacity, the industry’s focus has shifted to the next wave of pipeline expansions in the region. Of particular importance are three projects—Rover Phase 2, Broad Run and Atlantic Sunrise—scheduled for completion in mid-2018. 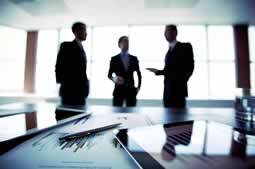 The three projects have a total capacity of 3.5 BCFD. Based on producer activity following past expansions, EVA expects their completion could result in an additional 1-1.5 BCFD of Northeast production coming online by June. The long-awaited 1,600 MMCFD Rover Phase 2 project—which carries gas from Ohio up to central Michigan—has encountered multiple delays due to local opposition, which has hindered drilling progress. However, it is now expected to enter service during Q2 2018. Upon completion, Rover Phase 2 will provide Northeast producers with access to downstream demand centers in the Midwest and Eastern Canada (the latter via an interconnection with Vector Pipeline). Like Rover Phase 2, the 200 MMCFD Broad Run Expansion Project being developed by TGP will also tap into Utica Shale production, mostly in West Virginia. In contrast, however, the pipeline will flow south, providing incremental firm transportation capacity to delivery points in Mississippi and Louisiana. Given the project’s smaller scale, it has not faced the opposition encountered by Rover and is set for timely completion, as scheduled, by mid-2018. 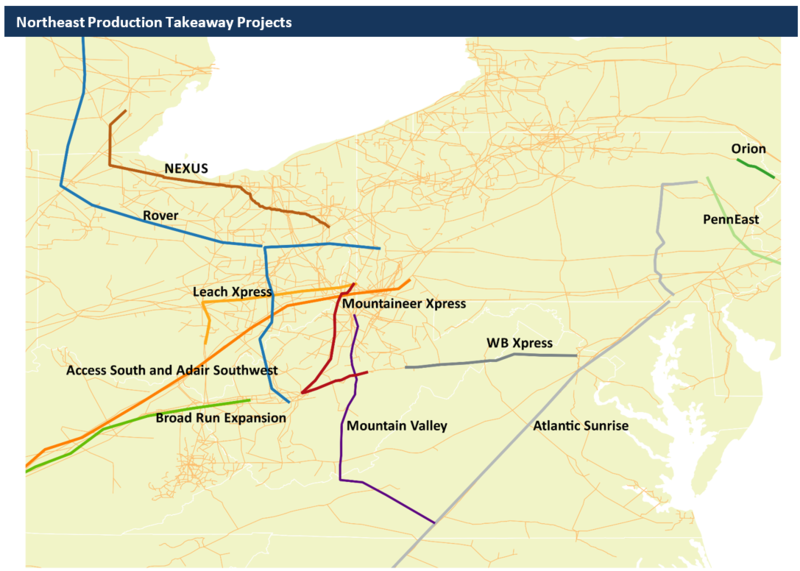 Lastly, Transco’s 1,700 MMCFD Atlantic Sunrise project will provide producers in central and northeast Pennsylvania access to key markets along the eastern seaboard. While a portion of the project has already been completed, the critical Central Penn Line—the upstream, greenfield portion of the project—is not expected online until June at the earliest. More recently, Transco announced the project may not be fully operational until fall 2018 due to “challenging winter conditions.” Regardless, when fully completed, the Atlantic Sunrise project will allow an additional 1,700 MMCFD of natural gas flow out of the Northeast producing region. Looking further into the year, five additional expansion projects in the Northeast—with total capacity of 8.1 BCFD—are scheduled to enter service at some point in Q4 2018 (key projects are summarized in the table below). However, in contrast to the projects coming online earlier in the year, these projects are in an earlier stage of development and are thus at greater risk of delay. Already, many of the corresponding FERC permits for the projects had been delayed due to the Commission’s lack of quorum for a portion of 2017. 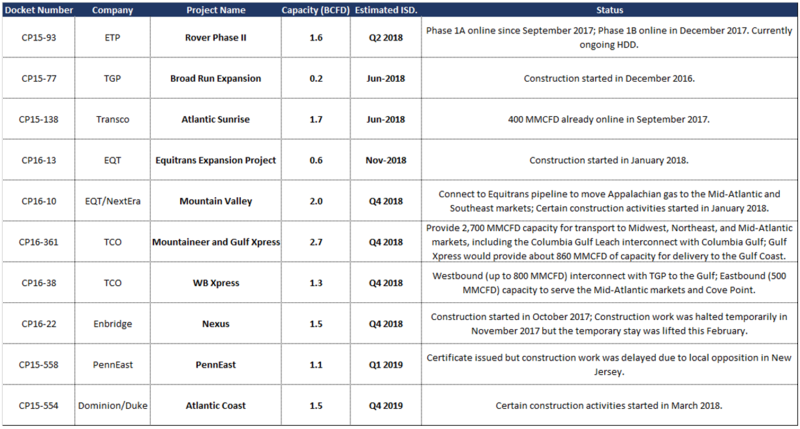 While FERC is now fully staffed, the previous delays had still forced developers to condense their construction timelines in order to bring the projects online by the scheduled start date. As a result, it is likely that at a few of the projects could experiences additional construction delays, potentially pushing the respective start dates into early 2019. The pressure on construction timelines could be particularly acute for the developers of two of the largest projects—the 2,000 MMCFD Mountain Valley and 2,700 MMCFD Mountaineer Xpress pipelines. Both projects originate in West Virginia, with the Mountain Valley designed to ship gas to the mid-Atlantic and Southeast and the Mountaineer Xpress targeting the Gulf Coast. The developers—TCO and EQT/NextEra —are racing to complete tree-clearing in West Virginia before seasonal restrictions take effect, which could happen as early as April 1. TCO’s 1,300 MMCFD WB Xpress is also designed to source gas at various receipt points in West Virginia and transport it westbound to the Gulf and eastbound to Mid-Atlantic market, as well as Dominion’s Cove Point LNG export facility. The project’s westbound component was originally scheduled to come online by June 2018, but TCO recently pushed back the timeline to November 2018. The remaining component of the project is expected to be completed by late-2018, as well—in line with its scheduled start date. Beyond delays at FERC, a few projects—such as the NEXUS Gas Transmission—have faced local and legal obstacles as well. The 1,500 MMCFD NEXUS project received FERC approval in October 2017 and was scheduled to commence construction shortly thereafter. However, soon after the approval, the D.C. 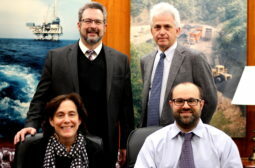 Circuit Court of Appeals issued a stay on the construction because the city of Green, Ohio challenged the water certification previously granted by the Ohio EPA. In February, NEXUS and Green agreed on a settlement, which ended the two-month-long stay and cleared the way for construction to begin on the greenfield pipeline. It is now expected online in Q4 2018 and will provide transport for Appalachian gas to the Midwest and Eastern Canada. Completion of the project will also de-bottleneck core producing zones in Appalachia and thereby allow producers to receive higher prices for their production. According to major producers who have reserved capacity on the pipelines scheduled for completion in 2018, the new pipelines will quickly be filled, but not exclusively through the ramp-up of new production. Instead, many producers have said that—at least in the near term—they will look for opportunities to redirect flows from elsewhere and will likely source certain amount of gas from third-parties. As a result, while production is expected to grow, the magnitude of growth will not match the 11 BCFD of new pipeline capacity coming online. This disconnect is due to several factors. First, several of the new pipelines projects will be interconnected and thus the cumulative sum of the added capacity overestimates the effective amount of new “takeaway” capacity. Realized flows will likely be distributed among the interconnected systems. For example, EQT’s Mountain Valley project is designed to connect to the Equitrans transmission system, potentially taking some of the incremental production from the Equitrans Expansion Project. Similarly, a portion of the Mountaineer Xpress project is designed to take supply from WB System. In addition, further growth in production will be contingent on the timely completion of the expansion projects, which are currently facing tight timelines and may experience further delays. Rover Pipeline, the region’s largest expansion project by volume, has experienced significant delays on the Horizontal Directional Drilling (HDD) progress. Originally targeting a Q4 2017 startup, the timeline has been pushed back multiple times and it is not expected to begin service until Q2 2018 at the earliest. Recently, West Virginia Department of Environmental Protection (DEP) issued a cease-and-desist order on the pipeline, citing multiple water pollution violations at the site of the Sherwood Lateral. 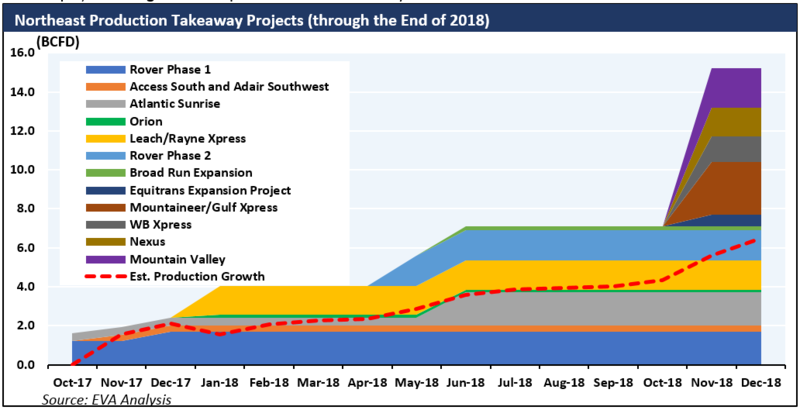 Finally, past expansion projects indicate that production is less likely to grow incrementally in the near term following the project entering service. For example, the filling of Leach Xpress did not come solely from a ramp-up in Northeast production, but also as a result of diverted gas flows from TETCO on the TCO system. Adjusting for the risk associated with each of the above-mentioned factors, it is less likely that incremental production will fill the 3.5 BCFD of added capacity from the projects coming online by mid-year (Rover Phase 2 – 1.5 BCFD, Atlantic Sunrise – 1.7 BCFD, and Broad Run – 0.2 BCFD). We expect to see an additional of 1.3 BCFD of new production across the three projects by June 2018, just under 40% of design capacity. This will remain true through the end of the year, when we expect to see Northeast production increase by 4.2 BCFD, just over 50% of the projects’ designed capacity (Equitrans Expansion – 0.6 BCFD, Mountain Valley – 2.7 BCFD, WB Xpress – 1.3 BCFD, Nexus – 1.5 BCFD and Mountain Valley – 2 BCFD).